Before meeting my husband, I had no concerns about money. If I wanted something… I bought it. It didn’t matter that my credit cards were maxed out. It didn’t matter that I didn’t particularly NEED another TV. I just went with it!! Even my student loans – you’d think I would try to double pay to get rid of them faster considering I landed a pretty decent gig right out of college. Nope! Not me – I paid the minimum required and life went on. Well, Bill is most certainly a horse of a different color. His parents are amazing with money and they taught him how to live in a more… financially sound manner. When we got engaged, do you know what he told me? He told me we couldn’t get married until all my bills were paid off. He didn’t want to start a union in debt. At first, I was SHOCKED. I mean – WHO CARES about my credit card balances?? RIGHT? HE did. And even though I didn’t agree with the whole thing, I did it. I sort of loved the guy and really wanted to get that ball rolling. I’m pretty sure he helped me pay them off – though I”m not 100% sure since it was over 12 years ago. In the end, we paid off all my bills and my student loans and married without any excess baggage. To this day, we carry a zero balance on all our credit cards and that’s something I never would have done EVER. And I mean EVER!!! 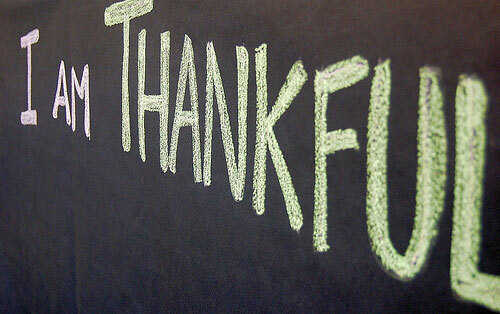 Your turn – what has your significant other taught you that you are thankful for?